T. A. Peterman needed a better truck to haul logs in the northwest, so after experimenting and then acquiring Fageol Motors, he came up with a formula to create rugged, tough trucks to battle curvaceous, undependable mountain roads, earning the nickname "betterbuilt" trucks. Peterman died in 1945, but management helped make Peterbilt a serious producer of heavy-duty trucks up to its sale to PACCAR in the late 1950s. In August 1960 Peterbilt moved to a new facility and became a division of PACCAR, carrying on its own tradition while retaining its product line. A western builder, Peterbilt's popularity escalated throughout the states through the 1960s, leading the company to start a new plant in Tennessee by the end of the decade. 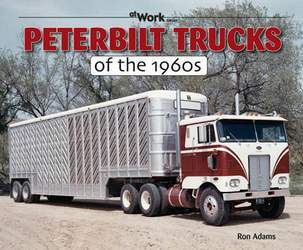 At the height of their popularity, Peterbuilts are portrayed through large format photographs taken at the time when these heavy haulers were put to work. See them in action and read about both the trucks and owners who operated them. Ron Adams has contributed to many truck books and articles in trucking magazines, among authoring a couple handfuls of books himself. He has been collecting truck literature and photographing trucks for over 40 years and has a vast knowledge of the trucking industry. Adams is a true-blue trucker dude who appeals to those with a love affair for semis.